Chris and Sonja - The Sweet Seattle Life: To Infinity, And Beyond! I’m looking for a good adventure quote to put on Emma’s wall. 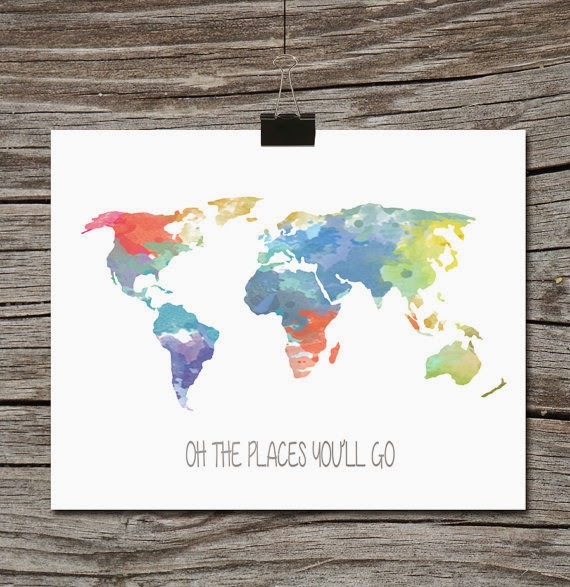 I may ask this Etsy seller if perhaps she could do a custom order, replacing the nice (but slightly overused) “Oh the places you’ll go” Dr. Seuss quote with something else. I really like the map graphics. Yes, a few of them are pretty sappy but given the state of my hormones, I’m not terribly surprised by my finalists. Mothers of newborns tend to wax poetic about their finicky little crossed-eyed angels. I like "No dreamer is ever too small. No dream is ever too big." and "Little One, this is the beginning of a grand adventure" :) Great idea! "Little One, this is a the beginning of a grand adventure." I think it's great for a kid's room and can grow with her for a while. Most of others strike me as overly mature. My favorite: "Tell me, what is it you plan to do with your one wild and precious life?" by Mary Oliver. It's not ADVENTURE, exactly, but more about life being something to be relished and, well... LIVED. I LOVE it.